After sweeping the Tigers, the Red Sox had won 12 of their last 13, including six in a row. In two weeks' time they had gained seven games in the Eastern division standings and taken the lead for the Wild Card. But the skeptics (meaning every caller to WEEI) pointed out that this had been accomplished against Toronto, Chicago, and Detroit, and said they'd still have to prove themselves against stronger competition in September. The next two weeks were critical. Anaheim and Texas, their main rivals in the Wild Card race, came to town, then they had a west coast trip against division-leading Oakland and four games in Seattle. And there were still six games left against the Yankees at the end of the month. After a day off Monday, the Red Sox beat the Angels behind the pitching of Curt Schilling Tuesday. Wednesday's matchup was Bronson Arroyo against former Sox pitcher Aaron Sele. Arroyo allowed two baserunners in the first, but got out of the inning unscathed. Sele didn't fare as well in the bottom half. Johnny Damon led off with an infield hit and scored on Mark Bellhorn's double. 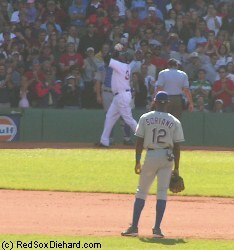 Manny Ramirez walked and David Ortiz singled home another run. Kevin Millar's sacrifice fly later in the inning scored another run, and Orlando Cabrera's triple made it 4-0. The Angels got two runs in the second, but Manny's sac fly in the bottom of the second made it 5-2 Sox. Arroyo was lifted in the third when two walks, two hits, and another sac fly allowed Anaheim to tie the game. But in the fourth, the Sox knocked Sele from the game, scoring two runs on back-to-back doubles by Damon and Bellhorn and yet another sac fly, this one off the bat of Big Papi. While Mike Myers and Terry Adams held the Angels scoreless, the Red Sox padded their lead with Cabrera's double and Dave Roberts' sacrifice fly in the fifth. Millar added a three-run homer in the sixth to make the score 12-5. Anaheim added harmless runs off Mike Timlin in the seventh and eighth, and Curtis Leskanic finished off the 12-7 win with a scoreless ninth. With the win, the Sox moved to 3.5 games ahead of Anaheim for the Wild Card. The Sox finished up the sweep of the Angels with a 4-3 win Thursday, then opened the Texas series with a dominating 2-0 win by Pedro Martinez Friday night, extending their winning streak to 10 games, and 16 of their last 17. After dropping Saturday's game to end the streak, they faced off against the Rangers again on Sunday. Another week had brought them another game closer to overtaking the Yankees, as they were now only 2.5 games back. The best way to get another streak started was to send Curt Schilling to the mound, and he did not disappoint. By the time Michael Young's solo homer in the fourth gave the Rangers their first baserunner of the game, the Sox had already put three runs on the board. Big Papi's home run in the fifth made it 4-1 Sox. Ortiz had missed the past two games with shoulder soreness after the collision at the plate last Sunday in which Dale Sveum foolishly tried to send him home from second on a single. At least it wasn't affecting his swing; the homer was his second extra-base hit of the day and his 35th round-tripper of the season. Gabe Kapler's two-run single in the seventh made it 6-1, and we turned our eyes to the out-of-town scoreboard for the Yankees-Orioles score. I had seen that Baltimore had had the lead in that game, but now it was tied 3-3 in the ninth. We started chanting, "Let's go, Orioles!" Unfortunately, when the final was posted it was 4-3 Yankees, so a win by the Sox today would keep them 2.5 out. Curt pitched brilliantly, striking out ten and not walking anyone, while throwing 98 pitches through the first eight innings. While Pedro was more famous for needing a strict 100-pitch limit, Curt had had his share of games where he had tired and started giving up runs after that mark, too. Both pitchers hate to leave a game early, and today he had really cruised and had a comfortable lead, so Terry Francona let him go back out for the ninth. He retired the first batter on a groundout, then gave up a single and a two-run homer. It was Michael Young's second of the day, but only three other players had even managed hits. 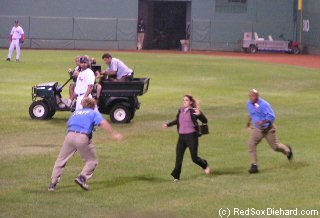 That's when Francona signaled for Keith Foulke to come in. Curt wasn't happy to leave, but we all gave him a long standing ovation as he departed. Foulke didn't make it easy, giving up two more runs to make it 6-5, but he was able to close out the victory. There were actually some people who worried that the Sox' success at home wouldn't carry over when they hit the west coast. (Why do I listen to WEEI when it only annoys me?) But they needn't have been concerned. The Sox swept the A's with scores of 8-3, 7-1, and 8-3. They lost Thursday in Seattle, but came back with big wins Friday and Saturday before losing on Sunday to fall 3.5 behind the Yankees. Despite going 5-2 in the past week, they had actually lost a game in the standings, but there were still six games left against New York, so the division was still within reach. After a day off Monday, tonight seemed a mismatch on paper, with Pedro Martinez going against 20-year-old rookie left-hander Scott Kazmir, who had been acquired in a trade with the Mets around the trading deadline. Unfortunately, as every Red Sox fan can attest, games aren't played on paper. Pedro gave up a home run to Carl Crawford to lead off the game. 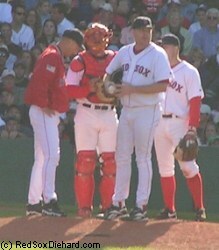 Johnny Damon reached base in the first, but was thrown out trying to steal. In the second the Sox had the bases loaded, but Bill Mueller hit into a double play to end the inning. Rocco Baldelli hit a solo homer in the third to make it 2-0. Kazmir struck out five straight batters in the third and fourth, as Red Sox hitters struggled to figure him out. It was the sixth time this year that they had faced a rookie lefty, and they had lost all five previous times. It was still 2-0 Devil Rays at the end of the sixth, when both starters were done for the night. In a battle of the bullpens, the Sox had a clear advantage on paper, too, but again, it was not aparent in this game. Alan Embree and Mike Timlin combined to give up two more runs in the seventh, and Ramiro Mendoza gave up another in the eighth. By the time the Sox finally got on the board in the bottom of the eighth, it was too late, but it was still a nice moment. Trot Nixon had spent most of the season on the D.L. with back and leg injuries, but he had finally returned during the road trip. After Kevin Youkilis singled with one out in the eighth, Trot came in to pinch hit for Gabe Kapler. We gave him a huge standing ovation as he came to the plate, and he promptly hit a two-run homer into the first few rows of the section I was in. After that, we stayed standing for the rest of the inning, not wanting to concede anything just yet. Unfortunately the inning ended quickly, and the Sox never were able to catch up. Scott Williamson came on to pitch the ninth to another warm ovation. He had also spent the majority of the season on the disabled list, and had just rejoined the team on the road trip. He gave up a single to the first batter, but quickly recorded a strikeout and two fly outs for a clean inning. It was doubtful whether he'd be ready in time for the playoffs, but we hoped that he would. My last game had been the first time the Sox had lost back-to-back games in over a month, and it didn't take long to reverse the trend. They beat the Devil Rays on Wednesday, and I was back for Thursday night's game. It had been raining all day, but it was down to just a drizzle as I left the T station to walk up to Fenway Park. 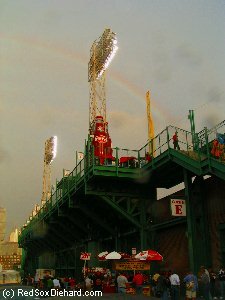 I went down Lansdowne Street to the bleacher entrance, Gate C, when a huge rainbow appeared. 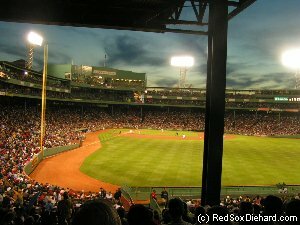 It formed a perfect arc, starting just behind the large "Keep the Faith" billboard over the parking lot, stretching over the street, and appearing to lead directly into Fenway Park. Keeping the faith is what rainbows are all about! It was the perfect symbol for a Red Sox game. This game certainly went much more according to plan than the one I had been to earlier in the week. Kevin Millar's double and Jason Varitek's groundout knocked in three runs in the first. Curt Schilling was pitching, and he was his usual dominant self. Rocco Baldelli's solo homer in the sixth was the first run the Devil Rays got. Meanwhile the Red Sox got one more run in the fifth on Mark Bellhorn's second double of the game, and chased Tampa Bay starter Mark Hendrickson with two more runs in the sixth. In the seventh, Millar's two-run homer and Johnny Damon's three-run homer gave the Sox an 11-1 lead. Curt was over 100 pitches when he gave up a run-scoring groundout and a two-run double in the eighth. Terry Adams was called in to get out of the inning and finished them off in the ninth for the win.